MCN’s Annual Gathering is an opportunity to engage in the conversation around social entrepreneurship on a global scale. We welcome you to join us for two full days of intimate, challenging sessions that address big topics including public health, off-grid technologies and refugee camps, food security, and clean energy. Let’s learn from each other. We build our agenda around our companies. We know that so many of our entrepreneurs go through the same sort of challenges no matter where they are in the world. Our goal is to build connections so all of our entrepreneurs can learn from one another and build lasting relationships. 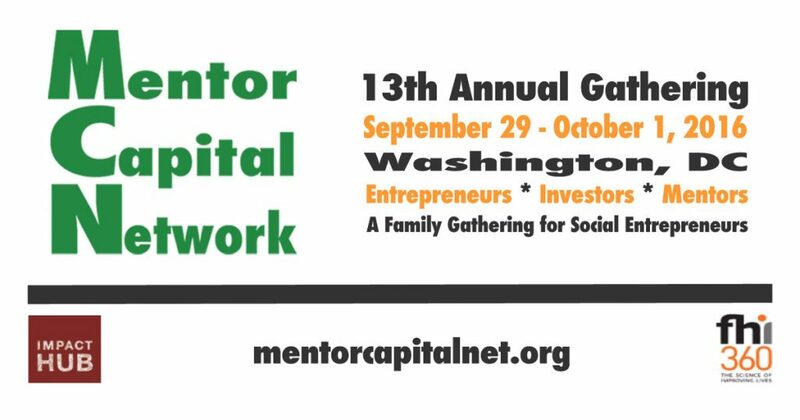 We know how important it is for entrepreneurs to meet with their mentors face-to-face, and we structure our Annual Gathering to welcome all new members of the Mentor Capital Network family into the fold. See which of our entrepreneurs attended this year’s event. Drink to Life. Known as Bebe Burkinabe in Burkina Faso, this company creates and distributes vitamin fortified liquid and powder drinks to support healthy pregnancies and child development in West Africa. Anas “Andy” Shallal was our keynote speaker on Friday, September 30th. Mr. Shallal is an artist and social entrepreneur and the founder of Busboys and Poets, Share Space DC & Mulebone Restaurant. His concepts create an environment where racial and cultural connections are consciously uplifted. Spaces to feed the mind, body and soul and where art, culture and politics take center stage and collide. “Rapid prototyping is the process of finding the fastest path to a direct experience of the thing you’re trying to create.” ~Tom Chi. Mr. Chi, the former head of Product Experience at Google X, led a special workshop on Rapid Prototyping. He was one of the masterminds behind the design of Google Glass, and taught hands-on skills for making rapid progress on key challenges in your business.